You know, some blog posts are destined to be long and involved, filled with links, and anecdotes and maybe even some history. Five or six pictures, a long, involved recipe with lots of tips on difficult techniques. This is not one such blog post. Basically, breakfast is hard. Breakfast is hard because mornings are hard, and let's face it, sometimes feeding oneself is also hard. And we all need simple ideas. 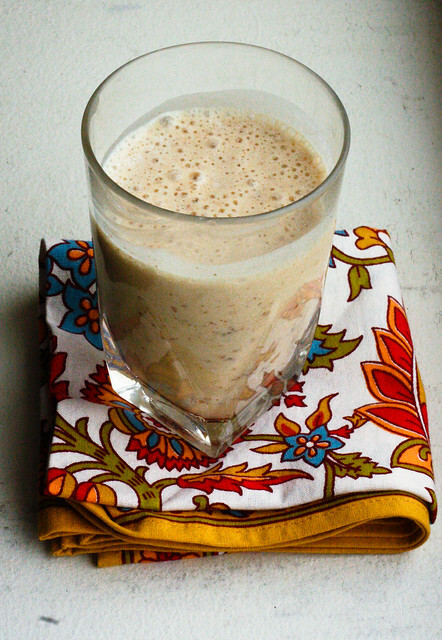 So although the date shake is classically made with vanilla ice cream, this version, from Bon Appetite's Food Lover's Cleanse uses fat free yogurt and milk. You don't need added sugar because the dates take care of that. One hint, though. Before putting the dates in the blender, make sure all vestiges of the pits are removed, even if they are pitted dates. Nothing worse than broken up chunks of pit bringing down your date shake. Good for You Date Shake, two of them! Wiz the yogurt, milk, dates and vanilla together, then add the ice and wiz it some more. Drink. This looks like the perfect way to get any day starter and would make any morning easier. For a long time I've enjoyed banana-date shakes made either with yogurt or low-fat milk, a pinch of cinnamon and a spoonful of ground flaxseed. Dates are so delicious and healthy, I'm tempted now to try a date-only smoothie!